Whether we find it a useful characterization or not, we seem to be stuck with the acronym of BRIC ever since Goldman Sachs first mooted that sequence of letters in 2001. The key idea was that the economic potential of Brazil, Russia, India and China was such that they could become four of the most dominant economies by 2050. Although the very idea seemed incongruous at the time, the name stuck. Each of the four countries has demonstrated that they, along with other emerging market economies, could indeed come to challenge the pre-eminence of the advanced countries by midcentury, if not before. 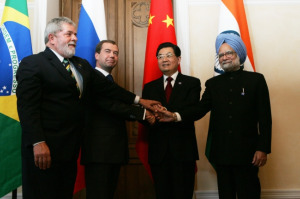 Although the BRICs were unable to decouple from the fallout of the international crisis, they have shown resilience. Even Russia, the worst affected this year, appears to be poised for a strong recovery in 2010, while the advanced economies will still be languishing. Trying to compare countries in terms of rankings is a mug’s game. Arguments and data can always be aligned to confirm a predetermined view. History is rife with examples of this. Unfortunately, there has been an onslaught of articles explaining why Russia should not be included in BRIC — the most recent examples by economists Nouriel Roubini and Anders Åslund — or that Brazil is the up and coming star of the BRICs with Russia being the outlier. For example, a recent issue of The Economist observed, “Sometime in the decade after 2014 — rather sooner than Goldman Sachs envisaged — Brazil is likely to become the world’s fifth-largest economy,” behind only the United States, China, Japan and India. Russia was pointedly not even mentioned. Of course, Brazil has come a long way and deserves to be commended. At the same time, I would suggest that it is not Russia that is the outlier among the BRIC countries. At least when it comes to economic dynamism, that accolade should go to none other than Brazil. While all of the BRICs have had their problems, it is clear that Brazil — not Russia — has been the outlier and is likely to remain that way for some time to come. But a closer look is warranted. Using 2000 as a base — starting just after the major crises in Russia in 1998 and in Brazil at the beginning of 1999 and including estimates for 2009 — Russia’s real gross domestic product grew at an average annual rate of 5.6 percent, considerably less than that of India and China. Over that period, the Brazilian economy did manage to grow slightly faster than advanced countries, but still only chalked up a rate of 3.2 percent. Why does this surprising disparity arise? Perhaps there is no simple explanation, but it seems likely that Brazil lagged behind for a fairly basic reason: low savings and low investment. Since 1995, China has saved 42 percent of its GDP and invested 39 percent annually. India saved 26 percent and invested 28 percent. Over the same time period, Russia saved 30 percent and invested 22 percent, while in Brazil the corresponding average figures were a more anemic 17 percent of GDP in each case, a level below that in most advanced economies. This gives Brazil a higher real cost of capital compared with its BRIC colleagues and makes it more difficult to generate anywhere near the same headline growth. Of course, it could be argued that Russia in particular used more leverage and foreign inflows to generate its outsized growth returns, which helps explain the much sharper contraction this year, but it doesn’t really come close to erasing the cumulative gap between the two economies. In any case, growing indications point to a faster real and nominal recovery in Russia in 2010. Brazil is an outlier in other ways. Many in Russia are, or should be, embarrassed that the country is in the No. 120 spot in the World Bank’s annual “Doing Business for 2010,” but Brazil comes in with an even more embarrassing No. 129. Russia also has stronger public finances, a stronger balance of payments, larger external reserves and lower public debt than Brazil. It is also far richer in terms of per capita income than Brazil. How does this translate into mid-term performance? International Monetary Fund projections show Brazil with a respectable 3.7 percent annual growth by 2014, visibly below the 5 percent figure for Russia, not to mention 8.1 percent in India and roughly 9.5 percent in China. And the key drag remains the low level of domestic savings in Brazil, which ran about 19 percent of GDP in 2008. Perhaps through currency appreciation against the dollar, the Brazilian economy could outperform on the nominal side. But with the Brazilian real already as strong as it is today and commodity prices still very buoyant compared with the average from 2003 to 2007, it would be surprising if Brazil generated the same kind of nominal dollar gains that it had over the previous five years. This is also true for Russia, but Russia is probably no worse off in this regard. Although from a dollar GDP level, Russia is about 18 percent below Brazil’s in 2009 (as a result of the 35 percent devaluation against the dollar a year ago), the latest IMF “World Economic Outlook” forecasts show Russia overtaking Brazil by 2014 and presumably continuing to move ahead in the second half of the decade. Based upon purchasing power parity valuation of GDP, Russia’s GDP remains higher than Brazil’s even in 2009 and even more going forward. So it is interesting that with all of the attention showered on Brazil, its economic performance has been relatively sluggish. This is not to denigrate the substantial achievements made by Brazil in absolute terms in raising its standard of living (although it has much greater income inequality than Russia as indicated by its Gini coefficient), but also relative to other countries. Looking at the facts from a macroeconomic perspective, it seems that Russia’s performance has in some ways been more impressive. And looking forward over the next few years, Russia is poised for significantly higher growth. But for Russia to become a global growth engine, it needs to cut excessive and inefficient spending, thereby reducing inflation and interest rates. This, in turn, will enable a more robust recovery to ensue. To be sustainable, it needs to address the reality and reputation of corruption and an arbitrary legal regime. Still, by about 2020, there is a greater likelihood that Russia will be in third place in terms of nominal GDP among the BRICs, with Brazil being the outlier. Of course, conventional wisdom does not appreciate when its underlying assumptions are challenged. In this case, it involves just an innocent game of projected rankings in a world where much can change in the next 10 years. To the extent, however, that real savings and investment are allocated based upon these perceptions, the game becomes more serious. The conventional wisdom needs to be reconsidered.